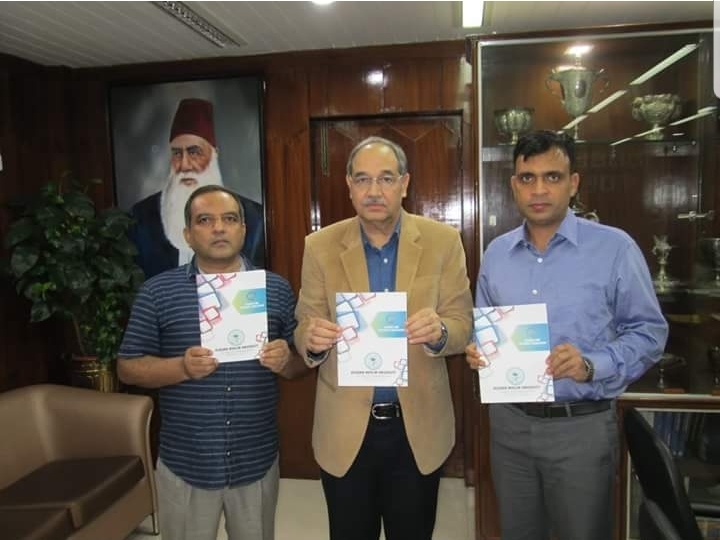 ALIGARH August 25: Aligarh Muslim University Vice Chancellor Prof Tariq Mansoor today released the prospectus of the Centre for Distance Education, AMU for the academic session 2018-19. AMU Registrar Mr Abdul Hamid and Prof Nafees Ahmad Ansari, Director of the Centre were also present on the occasion. Prof Ansari later informed that about a dozen new courses have been introduced from the current session, which include BSc in Computer Science, Postgraduate Diplomas in Human Rights and Duties, Data Analytics with Statistical Packages for Social Science, Marketing Management, Personnel Management, Office Management, Sales and Retails, Computer Programming and Certificates courses in Information Technology, Computer Hardware and Network Technology and Goods and Service Tax (GST). Besides the above, the Centre is already running 13 odd courses including SSSC (Arts, Social Science and Commerce), BA, B Com, MA, M Com, and several Postgraduate Diploma, Diploma and Certificate programmes.